Parklets are carparks that've been converted into social spaces for everyone to enjoy. 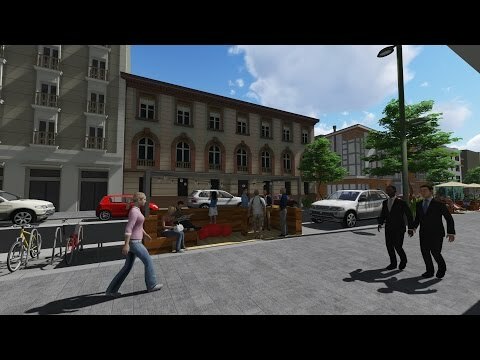 They’re an easy way to create quality public spaces without making drastic changes to the street. To make our city centre vibrant and social, we’re creating public spaces that meet the needs of people and businesses. We want to encourage people to spend more time in the city enjoying everything we have on offer. Parklets are one way we can do that. There are already three in George Street and a new one has just been built outside Coffee Club on the corner of Main Street and The Square. extend their footprint and their public visibility – for example, hosting a parklet gives cafés, bars and restaurants increased space to seat and serve more customers. Repurposing carparks can also encourage more people to walk or bike instead of driving. So what is a parklet? A parklet is a miniature park or public space created from an on-street car parking bay. Businesses and community groups build and look after them and can use them for their own purposes. But they’re also available for the enjoyment of the whole community. The Council pays for, installs and maintains the parklet base. This ensures they’re built to the correct design specifications. The parklet host pays for and maintains the goodies that go on top. This means they can design a parklet that suits their taste and budget. The host doesn’t have to pay for the carpark as it’s already paying generously to provide a public benefit for the community. The parklet can then be used by everyone. Palmerston North is lucky to have a compact, walkable CBD with plenty of public and private car parking. Peak parking occupancy in the CBD has been surveyed at 62%, meaning we have room to repurpose some of our carparks for everyone to enjoy. Design your parklet with users in mind. Watch this video for the basic design principles. The hosting process is simple. Get in touch with our Council place facilitator to learn about the rights and responsibilities of hosting a parklet, and how to design one to your tastes. The parklet outside Moxies in George Street was one of the first in Palmerston North. When Mike Waghorn considered how he could celebrate his ten year ownership of Moxies Café on George Street, his thoughts were initially inside the café's four walls. But looking out at the parklet across the road, he became inspired to do something similar. With a concept plan for his own parklet, Mike contacted the Council to explore how Moxies could have a better business presence on the street and add to the Little Cuba and George Street community. Using local services and materials, Mike and his supporters spent a few weekends in his daughter’s garage chipping away at the project. The parklet that eventuated capitalised on the afternoon sun by providing attractive, safe, high quality public seating for passers-by. The industrial-chic vibe raised the bar for retailers across the CBD and the Vespa centrepiece is a personal touch that reflects Mike’s love of motorcycles.